Walt Disney’s name is known around the world, but even better known are the charac­ters which he created — Mickey Mouse, Don­ald Duck, Goofy, and counties other cartoon personalities. 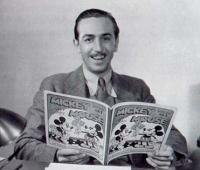 Disney was a cartoonist, a show­man , and a businessman of giant proportion. But basically he was a storyteller in the tra­dition of the Greek fabulist Aesop, or the other wise sages from different world cultures. Walt Disney was born in Chicago, Illinois, in 1901. At the age of five, his family bought a farm in Western Missouri, and as a small boy, Walt, drew sketches of the barnyard crea­tures and the scenes he saw around the farm. In 1910 his father sold the farm and moved the family to Kansas City, where he bought a newspaper delivery business. Walt and his older brother Roy were expected to help in this work, and at the early age of ten Walt was getting up at 3.30 a.m. to get the morn­ing edition of the Kansas City Star ready for delivery. His interest in drawing continued, however, and his father allowed Walt to take Saturday classes at the Kansas City Institute. When the United States became involved in World War, Walt wanted to enlist in the navy, but he was under age. Instead he joined the Red Cross to serve as an ambulance driv­er. Though the war ended before he even got to Europe. Walt was briefly assigned to France, where, besides driving health vehi­cles, he acted as his unit’s unofficial artist. When he returned to the United States in 1919, he was determined to make a career in commercials art. He eventually found work with the Kansas City Film Ad Com­pany which drew commercial for use in lo­cal movie theatres. Experimenting with the use of cardboard figures in animation, the Kansas City Film Ad gave Disney valuable training, and in a short time he began to form his own production company. Under the company name Laugh-o-drams, Disney and a talented draftsman from Holland Iwerks, produced a number of animated cartoons, choosing for their subject mat­ter topics of local current interest as fairy tales. Running out of money in 1923, Walt closed his business in Kansas City and moved to California. There, in partnership with his brother Roy, and a capital base of $280, the Disney Studio was begun. While Walt and his staff of artists were responsible for creating the animated car­toons, Roy was responsible for the manage­ment side. This division of authority worked remarkably well. The first series which the studio produced was “Alice in Cartoonland” which combined a live “Alice” with cartoon drawings. After 60 episodes in this series, the Disney Studio created the character, “Os­wald, the Lucky Rabbit”; but not having full copyright for Oswald, Disney looked for a new character which the studio would dis­tribute itself. Mickey Mouse was the product of the collab­oration of Walt Disney and Ub Iwerks. Find­ing that circular forms were simpler to ani­mate than elongated shapes, Iwerks construct­ed Mickey from two large circles, one for his body and one for his head, to which were at­tached two smaller circles for ears, hose-like arms and legs, large hands, and large feet. Walt Disney himself defined kind of person­ality which Mickey would have and 20 years provided the falsetto voice which Mickey had. The Mickey Mouse who appeared for the first time in 1928 in the cartoon, “Steam­boat Willie”, was not the well-behaved char­acter which the world knows today. He was mischievous and he did get into trouble, though he. did not have the mean streak which many cartoon characters have in “Steamboat Willie”. Mickey stretches a cat’s tail to make a stringed instrument, makes musical melody as he milks a cow’s udder and uses a cow’s teeth as a xylophone. After the first Mickey Mouse cartoons suc­ceeded in making Mickey a sort of little man’s hero, Disney found that the public expected him to act properly at all times. When Mickey stepped out of line a car­toon, the Studio would receive letters from countless people and organizations who felt their model for correct behaviour was be­ing compromised. This made it more diffi­cult to put Mickey into comic situations and he came more and more to act in the role of a straight man, and the proper lit­tle gentle mouse we know him to be. Laugh­ter was sparked by new cartoon characters which Disney’s artists created. Pluto, Mick­ey’s faithful but slow-witted bloodhound appeared in 1930; the incompetent Goofy in 1932; and the notorious, incomprehen­sible Donald Duck, voiced by Clarence “Ducky” Nash. In addition to the Mickey Mouse cartoons, the Disney Studio in the late 1920s and ear­ly 1930s worked on a new kind of animated film, which they called the “Silly Sympho­nies”, in which music and cartoon anima­tion joined together in telling a story. This format allowed Disney to experiment with different types of subject matter and with different technical processes, such as the use of Technicolor. Of all the “Silly Symphonies”, Disney’s “Three Little Pigs” (1933) was the most successful, and its popularity which the public set Walt to thinking an even more unheard of project — an animated cartoon story with would run for more than an hour. In making a feature-length film, Disney would have an opportunity to use more com­plex plots and develop more elaborately the characters in the story. He hoped to ani­mate a fairy story giving it a kind of magic which live action films could not have. Other movie executives in Hollywood thought he was making a disastrous mistake. It was their belief that the public would not want to sit through such a long cartoon feature. Disney started to set down ideas in 1934. He chose the story of Snow White for his first feature film. Early outlines and manuscripts show the stages which Disney, his artists, and writers went through in reaching their final product. Though Snow White, the wicked queen, and the prince were standard fairy tale characters. Disney’s characterization of the dwarfs was unique. Early manuscripts show how Disney narrowed down from more than 40 names personality sketches (Biddy-Wiggy, Biggo-Ego, Gaspy, Awful) to the seven dwarfs who are now a part of a child’s cul­ture — Sleepy, Bastful, Happy, Sneezy, Doc, and Dopey. Original songs were written to move the story along, and a fairy tale mood of timelessness was created. When Snow White and the Seven Dwarfs opened Christ­mas week, 1937, it was an immediate suc­cess, and Disney was awarded an Academy Award for his significant screen innovation. In 1940 Disney gambled once again, this time producing the film, “Fantasia”, an animated cartoon interpretation of classical music by composers such as Bach, Brahms, and Tchaik­ovsky. While audience reaction to the film was mixed, one New York critic writing about the film one day after its opening said, “Mo­tion picture history was made last night”. And indeed, Disney had broken all precedents. “Fantasia” also shows Disney’s willingness to experiment with technological innova­tions as well as with story and theme. He designed a sound reproduction system which anticipated stereophonic sound by placing speakers (30 in all) around the auditorium as well as behind the screen. Disney’s other feature cartoons of the 1940s and 1950s have become part of a child’s heritage. “Pinocchio”, “Dumbo”, “Cinderella”, “Peter Pan”, and others showed the range of storyline that could be interpreted through cartoon animation. The Disney Studio con­tinued to develop new techniques and equip­ment to expand their creative potential. In the 1950s Walt Disney began to branch out into other areas of entertainment. He started to give more serious attention to live action films and to nature films. He began a long-running television series. And he opened the first of his famous amuse­ment parks, Disneyland. Disneyland was the realization of an idea which Disney had years before when he had taken his daughters to local amusement parks or playgrounds. He wanted to build an amuse­ment park at which adults could enjoy them­selves as much as the children. Planning for Disneyland began in 1952. Plans were drawn and models were built long before the site was chosen for Disneyland. In this sense, the park is the realization of a dream and not a product defined by the physical environ­ment. Disney believed the park should be cir­cled by a railroad train and consist of sepa­rate areas each identified by a single theme. He recognized that people had to be kept mov­ing in the park as he expresses in his state­ment, “You’ve got to have a wienie at the end of every street”. This means that differ­ent attractions had to be located in such a way as to act as a magnet in attracting the park visitors. Disney characters and refer­ences to Disney movies would be throughout the park. A site was located in southern California and the park was built according to the plan. Since the park opened in July 1955, it has become a part of the itinerary of nearly every trave­ler visiting California for the first time. An average of 50,000 visitors come to the park each day. Built almost like a movie lot, Disneyland’s streets consist of facades which open into rides, entertainment areas, stores, and restaurants. It delights the imagination of the millions of men, women, and children who have ever spent a day there. With the success of Disneyland clearly es­tablished, Walt Disney began thinking of building a second park that would be availa­ble to the people on the east coast of the United States. He did not want to duplicate Disneyland, but rather create a complete vacationland in addition to the amusement com­plex which would be the core of the new park. He also envisioned a separate area which he called EPCOT - an experimental prototype community of tomorrow — which would draw its ideas from the new technologies. In 1964 land in central Florida was purchased for Walt Disney World. But Disney himself would not live to see his second park open. In October 1966, Disney learned he was suffer­ing from lung cancer. Though one lung was removed, he died December 15,1966, in a hospital directly across the street from his studio. The work which Walt Disney began contin­ues today. Walt Disney World was opened in 1971 by Roy Disney, and EPCOT Center was inaugurated in December 1982. The first Disneyland outside of the United States was opened in Japan in 1983. The Disney Studio produced live action films regularly, and fea­ture-length cartoons, cinematic jewels in the Disney legacy, have periodically been pro­duced. Like few other people, Walt Disney succeeded in making his dreams come true.